Providing spacious floorplans in a central location, the third phase of OLIVIA townhomes is now selling in South Surrey. 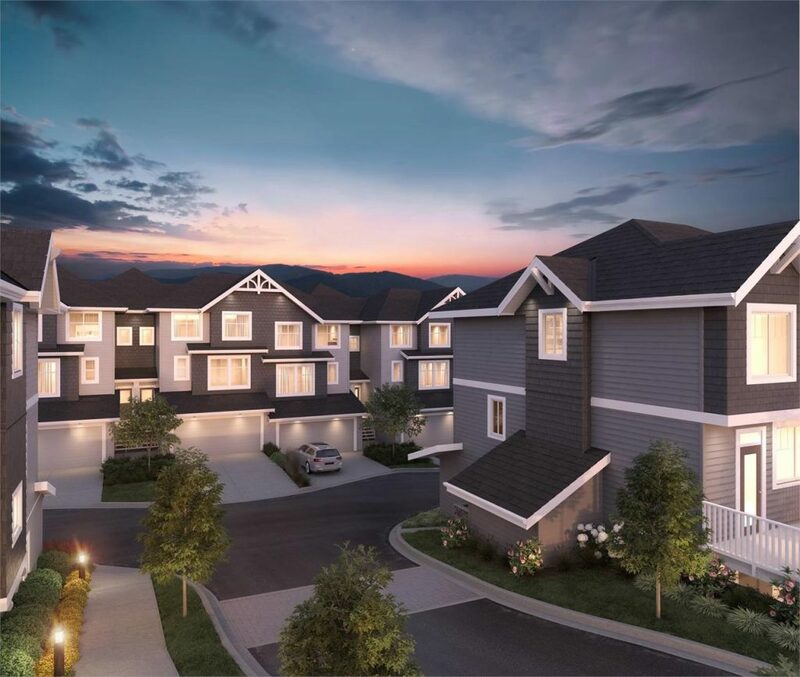 Already 60 per cent sold, Woodbridge Properties encourages prospective buyers to visit the new showhome in Surrey and take advantage of a limited time promotion for a decorating allowance of $10,000 in included upgrades. Nestled in a gently sloping hillside, OLIVIA features a total of 37 townhomes ranging in size from 1,499 square feet to 2,057 square feet. Designed by award-winning Barnett Dembek Architects, the craftsman-style homes boast classic front doors with customized entry hardware. The townhomes are surrounded by mature trees and lush landscaping and include fenced yards for extra privacy. Residents can enjoy the views of the surrounding neighbourhood or entertain guests from their very own spacious patio and/or deck. For added convenience, select homes also offer full-size driveways. The open-concept interiors exude a warm and inviting space with nine-foot ceilings on the main floor and generous lighting throughout. Complete with stylish finishes, the homes feature wide-plank laminate flooring in the main living areas, large energy-efficient windows and smooth paneled interior doors. Homebuyers can also customize their residence from a choice of two contemporary designer palettes, Oak and Ash. To maximize storage, the townhomes include a wire shelving system in all closets and pantries, and the laundry room is conveniently located on the upper floor. Thoughtfully designed for convenience and functionality, the chef-worthy kitchens boast spacious pantries, an island, sleek Quartz countertops with coordinating ceramic tile backsplash, over-height cabinets and stainless steel appliance packages. After a long day at work, residents can unwind in the elegant bathrooms, complete with a soaker tub, glass shower and a full-width vanity mirror. Located on a quiet street surrounded by green space, OLIVIA offers quick access to schools and modern conveniences. Within minutes, families can walk to Sunnyside School and Southridge School. Outdoor recreational amenities are around the corner, such as community centres, beaches, pools and a park located across the street. Families can also enjoy activities at the new Grandview Heights Aquatic Centre, which is only a five-minute drive away. Nearby amenities include grocery stores, boutiques, cafes, and restaurants. For travelling around the Lower Mainland and to the US border, Highway 99, 15 and 152nd Street are within close proximity. Some homes are move-in ready and the rest will be completed within a month or by early 2018. Interested buyers are invited to visit the new showhome located at 15717 Mountain View Drive, in Surrey. Opening hours are daily from noon to 5pm, except on Fridays when the sales centre is closed. Click here to register for the latest details. For more information call 604 536 9333, email olivia@wbhomes.ca or visit .wbhomes.ca/olivia.